Jon Boat - Page 2 - Lake Houston Fishing! but so hard to find . Unfortunately, I guess I could drive out to katy once a month and load up but that is a hike! If I knew my 94 could run on e10 without an issue id rather just do that, I live 5 minutes from the lake and it would be so much more convenient. The great thing about Bucees in Katy is Bass Pro is the exit before it lol. Before I got skid tank I got one of the 19 gallon rolle tanks and used it. For your motor size it ought to keep you in gas for awhile. Yea Raptor, I am going to make the trip today and do just that, thanks again for the info. Rather than drive from Lake Houston area to Katy to buy gas, I would buy a quality name brand gas locally. Disconnect the fuel line from the tank and run the outboard dry after using, especially if you won't use the boat for a few weeks. Assuming you have a gas truck, not diesel, I would just pour whatever you have leftover from the outboard tank into your truck. Next weekend just refill your outboard tank. More assuming...you are using a 6 gallon portable tank. Everyone has their favorite fuel stabilizer. SeaFoam is a good cleaner, I use Startron as a stabilizer. Yes get a fuel/water separator. Just don't use a Sierra brand spin on filter element. I had one rust internally, and since then I use Yamaha. You could probably use the Yamaha mini element on that outboard. Always carry a spare spin on element and a spare in line filter. Some folks have reported issues using a fuel/water separator on small outboards if the tank is in the bow. Maybe fuel pump weakness, I'm not sure. That rig would work great in Sheldon Reservoir as well. And below the Lake Houston dam. will mess your catalytic converter up. X2 on what Sticko said about 2 stroke gas with oil in it. Everything I have is 4 stroke. Forgot you said it was an older outboard. I got confused when you said you had an outboard on order. Just between you and me...you can get non ethanol gas in Johnson Bayou Louisiana. I would rather drive there than to Hwy 290. 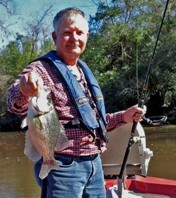 And there is good fishing in Johnson Bayou, and a good ramp. Goes into Sabine Lake. Don't tell anyone. Lol thanks yall. I've ordered a filter and I'll just be using the e10 with stabilizer, definitely wont be pouring it into my tank. It is an older motor I bought from a marina out of state and had it shipped here, got it for a steal. If I break it I'll spring for a new one but hopefully that's a ways down the road when I'm buying a new bass boat lol.